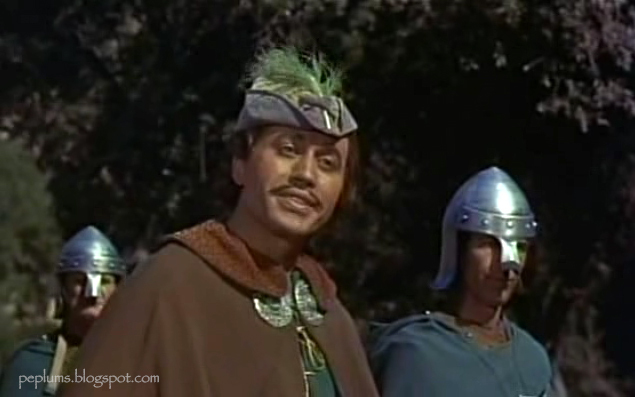 PEPLUM TV: Michael Ansara - R.I.P. 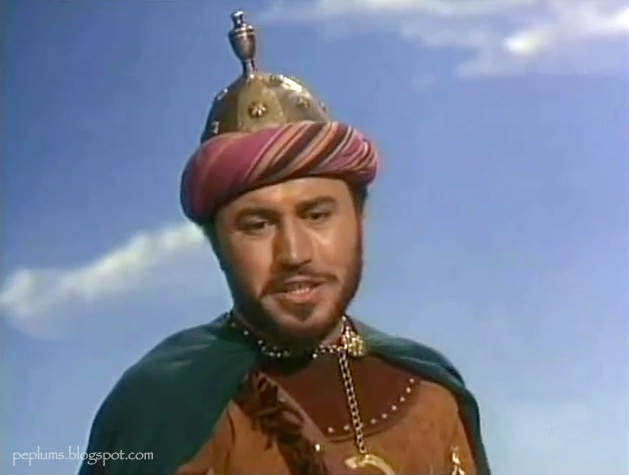 Veteran actor Michael Ansara died last week when I was away. Michael played in over 189 roles, in film and television, mostly on TV. But he did start acting in films including many from the PEPLUM genre. 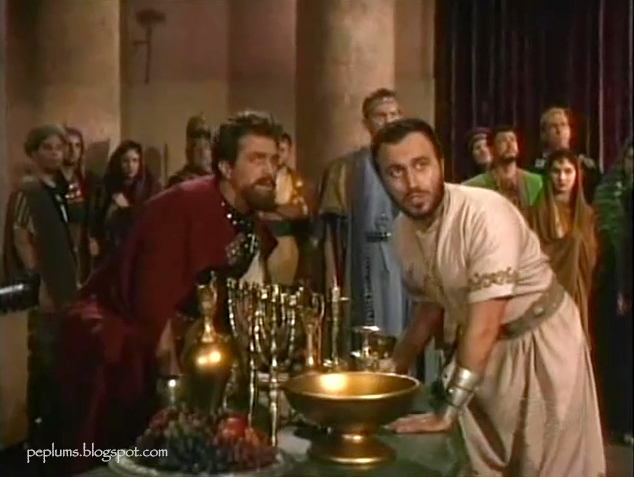 In the top and the screenshot directly below the Syrian-born actor was right at home in SLAVES OF BABYLON as Prince Belshazzar. 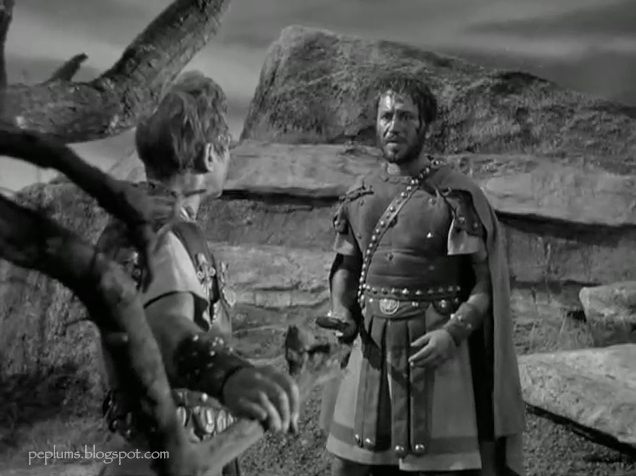 A very good actor who happened to be married to Barbara Eden at one point, his list of roles/films is quite impressive, with appearance in SIGN OF THE PAGAN, DIANE, JUPITER'S DARLING, THE EGYPTIAN, PRINCESS OF THE NILE, BANDITS OF CORSICA, QUEEN ESTHER, etc. When he died headlines everywhere mentioned his single role on STAR TREK the original series. He did much more than that. He would have been great in a leading role in a major PEPLUM film but alas it didn't happen. 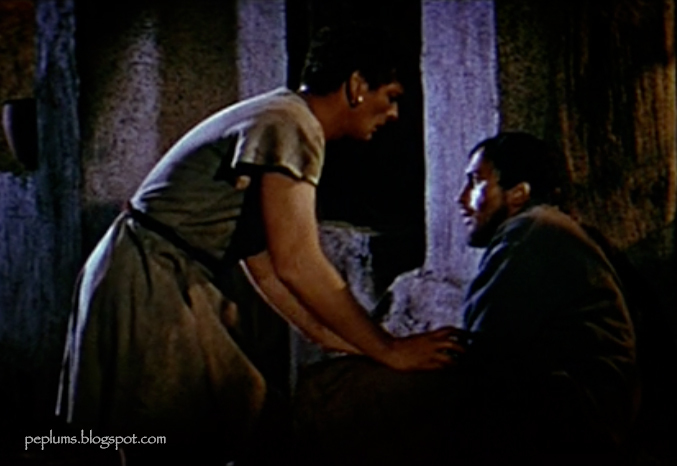 Michael Ansara was Pindarus in JULIUS CAESAR (1953). It's a small but pivotal role, here getting ready to kill Cassius (John Gielgud) under Cassius' command. 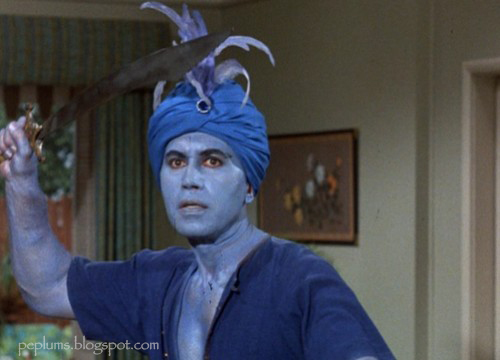 Ansar as the Blue Djinn in Jeannie TV series with his wife Barbara Eden. It was a bit before my time, but I mostly remember him as Cochise on Broken Arrow (must have been some later reruns). And as Barbara Eden's husband! I'm sure I saw it first run back in the day, when I used to watch Star Trek on the TV in the basement of my parent's house (OMG, did I just say that? But, in all fairness, I was just graduating from grammar school/starting high school at the time), but I don't have any clear recollection of his original Star Trek appearance. Requiescat in pace. And nil nisi bonum. My first acquaintance with Ansara was when he played on television on the series "Lost In Space" where he fought Papa Robinson (Guy Williams, who once played Zorro with Disney) with electric swords (lots of sparks and smashed fake trees) which Williams won handily. Of course he won. He was Zorro, for goodness sakes. Wow, GREAT photo essay, he was a familiar face but I had no idea of the extent of his contribution. Good to have you back! I also remember him as Cochise on the TV Series BROKEN ARROW which ran from 1956-1959. My opinion is that this was over all his best acting role. He was very convincing as the famed Indian Leader. R.I.P.